Eighteen state lawmakers have jointly called for denial of a permit renewal needed by an industrial-scale composting plant near the Port of Wilmington, citing chronic, foul odors that have victimized residents over a wide area. The appeal to the Department of Natural Resources and Environmental Control arrived on the final day of public comment for continuation of a state approval issued for Peninsula Compost LLC’s Wilmington Organics Recycling Center. More than 200 people turned out for a DNREC public hearing on renewal of the company’s five-year “beneficial use determination” permit. Critics and opponents included residents, church leaders, government officials and environmental group representatives. Problems and violations at Peninsula Compost have occurred consistently since it opened, with a 2012 fire temporarily shutting down Port of Wilmington operations and the facility racking up violations in each of the last three years. Peninsula began developing the site with substantial fanfare and state and local support more than five years ago, aiming to divert as much as 160,000 tons of food waste and other castoffs from local landfills each year. Although its intake included large volumes of spoiled fruit and fruit imports from the port, other wastes came in from sites around the region, including from as far away as New York. Developers had intended to use high-tech cover fabrics and composting practices to rapidly convert wastes into marketable products. Raw material contamination with plastics and other unapproved materials, weather and poor market conditions all worked against the operation at times, however. Operation problems and excessive stockpiles of finished and raw materials rolled odors across a wide area, despite production changes and placement of huge odor-masking spray devices around the site. DNREC officials could not say when DNREC Secretary David Small would rule on the issue. This entry was posted in Environmental Concerns and tagged BioHitech America, Peninsula Compost, Problems with Composting, Wilmington Organic Recycling Center on September 29, 2014 by Lisa Giovannielli. As food waste represents more than 30 percent of the material disposed of in landfills today, haulers face increased demands for viable diversion options from consumers and the government, who are attempting to achieve sustainability and zero waste goals. The diversion of food waste is a complex issue that has historically involved extensive logistics resulting in significant costs to waste haulers and in turn to their customers, the generators of food waste. The current disposal infrastructure in the U.S. typically requires the collection and transportation of food waste in traditional vehicles, resulting in significant costs being passed on to the generators as well as the unnecessary consumption of fossil fuels and associated harmful emissions. When analyzed correctly, these factors often negate the benefit of the diversion of the waste itself. As state and local regulatory agencies continue to implement bans on food waste in landfills, the lack of viable disposal options in proximity to the source of the waste will prove to be a barrier to ultimately achieve these goals. Fortunately, there are new technologies that provide the resources and tools necessary to offer consumers a means of compliance while presenting new opportunities in an industry that is in need of a solution. In order for the consumer to comply with new regulations in a cost-effective manor, it is necessary to identify a solution that does not rely on traditional vehicles and manpower to collect and transport waste long distances to compost facilities or anaerobic digesters. In addition to the obvious economic and environmental challenges associated with traditional collection and disposal, the consumer is forced to sacrifice valuable kitchen or retail space for the on-site storage of food waste waiting to be collected, as well as the inability to quantify the results of their efforts. It is also virtually impossible to accurately measure each generator’s waste and provide the reporting that is needed to track diversion efforts and carbon reductions. Real data is a key component to not only quantifying our diversion efforts, but more importantly to provide generators with the information needed to get to the root of the problem. It is important to examine not just how we dispose of this waste, but how much of it we actually create. Over the past few years, several new technologies have emerged in the U.S. that make the disposal of food waste much less demanding, including on-site options, such as our Eco-Safe Aerobic Digester. Aerobic digesters accelerate the natural decomposition of food waste and convert it to nutrient-neutral water that is transported safely through standard sewer lines without any additional handling required. Some of these units run using a continual process, enabling waste to be added as needed with no chemicals used and no airborne contaminants present. 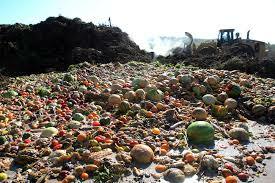 The most logical, cost effective solution to this growing issue is to treat food waste at its point of generation. This would eliminate the need for increased logistics and provide the most cost-effective and environmentally-friendly option in the marketplace today. Digesters tend to work similarly to a human stomach. They are designed to process a wide range of food waste types, such as fruit, vegetables, cooked and uncooked meat and poultry, fish, dairy and bakery items. BioHitech America’s on-site aerobic digester can eliminate up to one ton of food waste in a 24-hour period. In addition to being an effective tool used to decompose food waste, the Eco-Safe Digester serves as a powerful management tool, providing key metrics to users that can help indicate inefficiencies within an organization or quantify the benefits of reduced disposal and corresponding “truck rolls.” The digester is equipped with a scale that weighs food waste each time it is added to the unit, clearly determining where, when and what food waste is disposed of. Since the digester provides real data rather than relying on assumptions, management can identify opportunities for improvement in the process. The BioHitech Cloud, a reliable, manageable and secure reporting platform for data that can be accessed on many types of devices, measures key metrics to optimize the waste disposal process. The reporting provides an accurate audit trail to support environmental directives that tracks savings, compares utilization, highlights successes and uncovers anomalies. Organizing and preparing reports is easy and can be designed for single or multiple locations, by geographical areas, by management structure or by season. Reports are also easy to access and can be created from several devices, including computers, tablets and smartphones. Quantifying food waste data in real-time is paramount for industries to provide accurate, concise and useful analytics in order to facilitate zero-waste behavior within an organization. This information, along with a heightened consciousness about the alternatives to dumping food waste in landfills, will drive tremendous opportunities. According to the EPA, it is estimated that if we were to prevent food waste from either being created or disposed, it would be similar to removing a quarter of all cars in America from the road. The increasing emphasis on food waste diversion will also continue to support the development of other disposal methods, such as anaerobic digestion, a growing means of disposal in the U.S. As in many parts of Europe, the U.S. will continue to strive to utilize organic waste as feedstock for energy production. One of the U.S.’s largest generators of food waste, Walt Disney World, has recently announced a switch from composting to using anaerobic digestion to not only remove its food waste but to help power the operation of its parks and resorts. Anaerobic digesters can be capital intense and therefore will rely on significant tip fees to help subsidize the cost of construction and operation. While this can present a challenge in obtaining feedstock, it is likely that the larger obstacle will be the inability to site facilities within close proximity to large volumes of feedstock, leading to significant costs to collect and transport waste to its final destination. These costs along with the necessary tip fees imposed for disposal will be challenging to developers of these types of facilities and burdensome on the consumer. In most cases, anaerobic digesters require food waste to be in some form of liquid or slurry, adding additional costs to support the process. At BioHitech America, we continue to evolve our technology to provide our customers with an effective means of generating anaerobic digestion feedstock without losing the on-site nature and data analytics of aerobic digesters. By pre-processing the waste at the point of generation, we are able to significantly reduce the volume of waste needing to be transported and providing the ability to perform said transportation with more efficient vehicles than traditional waste collection trucks. BioHitech has partnered with leading anaerobic digestion companies, including CRMC Dartmouth Bioenergy, an anaerobic digestion facility located in New Bedford, Massachusetts, to pilot its technology as a pre-processing unit for CRMC’s recently constructed facility. This facility accepts commercial/industrial food wastes, organic sludges, FOG or other liquid or slurried non-hazardous organics. 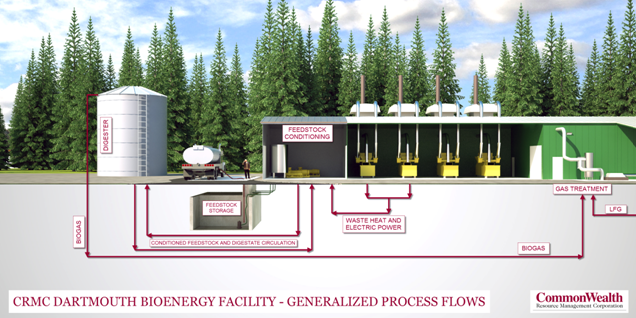 The Bioenergy Facility is the first of its kind to be sited at an operating Massachusetts landfill and the first developed in the state to produce biogas for use in a pre-existing landfill gas-to-energy facility. As the evolution of the food waste industry progresses, on site solutions such as the Eco-Safe Digester and other similar products will become increasingly relevant to its success and paramount to other disposal methods such as anaerobic digestion and future technologies. Being more progressive and adopting new means of food waste disposal is no longer just a social responsibility; sustainable alternatives are becoming a mandatory requirement. This entry was posted in Technology and the Environment and tagged Aerobic Digestion, BioHitech America, Eco-Safe Digester, Food Waste on September 26, 2014 by Lisa Giovannielli. Starting October 1st, food waste from large institutions and supermarkets — not residents — will be collected. And only some of that will be headed to anaerobic digesters. Massachusetts’ state-wide food waste ban, which was a decade in the making, puts the commonwealth among leaders in the United States in addressing an indulgence that is not unique to our modern existence: throwing away large quantities of food. The Massachusetts Department of Environmental Protection is hoping to find alternative methods of disposal because landfilling is expensive as well as send the message to discourage the creation of waste altogether. The hope is that ordering and preparing will be questioned to ensure less ends up going to the trash as a part of their process. The more complete solution however, according to many environmentalists and an increasing number of businesspersons, is utilizing the process of Anaerobic Digestion. Food scraps fed to microbes in a heated tank without oxygen is converted, in a month or less, into biogas — mostly methane — that can be captured and used to generate electricity. There are currently six wastewater treatment plants in the state that use the process. The egg-shaped buildings visible on Deer Island in the Boston Harbor do that to make power for the sewage treatment process. There are also three Anaerobic Digesters in Massachusetts, which will gladly be accepting food waste under the new regulations, however there is a considerable amount of pre-sorting and processing of the food waste before it can be converted into a pumpable slurry for injection into the digesters. While Anaerobic Digestion is a forward thinking option, it is still scarce in the United States because it is an expensive undertaking. When Anton Finelli and his partners did the research they were shocked to discover you could count on one hand the anaerobic digestion projects in North America designed specifically to take and process food waste. So, his company, Common Wealth Resource Management Corporation decided to build a pilot plant at the landfill site in Dartmouth, and hopes it attracts customers. The state hopes the ban will spur construction of more anaerobic digestion and other solutions to turn organic waste into a resource. This entry was posted in News and tagged Anaerobic Digestion, BioHitech America, CRMCX, Mass Food Waste Ban on September 11, 2014 by Lisa Giovannielli. 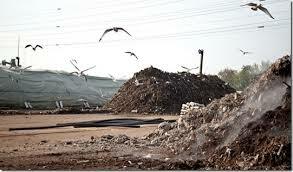 What is the Biggest Cost Associated with Waste Disposal? The number one cost of waste disposal is buying the goods that eventually end up in your waste stream. For example, take an 8-inch, round head of lettuce. If that head of lettuce wilted before you could sell it or use it and you threw it in the garbage whole, the volume that the head of lettuce would displace in the trash would be about 268 cubic inches. If you were paying the equivalent of $8 per cubic yard for waste disposal, the relative cost impact would be less than 5 cents. However, that same head of lettuce might have cost $1.50 to purchase originally, or 30 times the cost of disposal! What a waste. $1.55 spent on each head of lettuce from the time it is purchased till the time it is thrown out. If you had a piece of technology that tracked your volume of waste and told you how to avoid the purchase of those items, well it would seem that the simplest and cheapest method for savings could therefore come from source reduction, not from switching methods of disposal. Source reduction prevents the purchase and production of waste and is a tremendously beneficial method of sustainable waste management. Environmentally, source reduction drastically lowers the amount of materials, labor and energy used for creating, storing, and selling products. Economically, source reduction cuts back on the amount of waste that is thrown away, thus lowering waste disposal costs. However, in order to reduce the food waste at the source, you must know what is wasted. Utilizing a technology solution like the Eco-Safe Digester allows you to measure, track, and reduce what is wasted in addition to removing the waste from landfills. A solution that moves you towards a more sustainable food waste management process helps to make disposal costs a thing of the past. 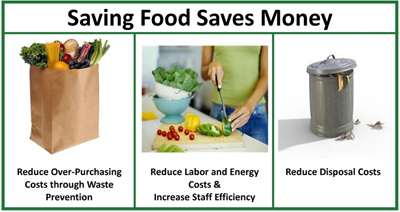 While disposing of waste into landfills continues to be the most utilized method of food waste management in the United States, source reduction has proven to be more sustainable and economical. If restaurants and supermarkets could avoid creating waste by focusing on their purchasing and prep practices, the wins would be far greater than managing the waste on the back end. This entry was posted in Technology and the Environment and tagged Eco-Safe Digester, Managing Food Waste, Source Reduction on September 3, 2014 by Lisa Giovannielli.